Fishing is one of the main sources of subsistence for the villagers. 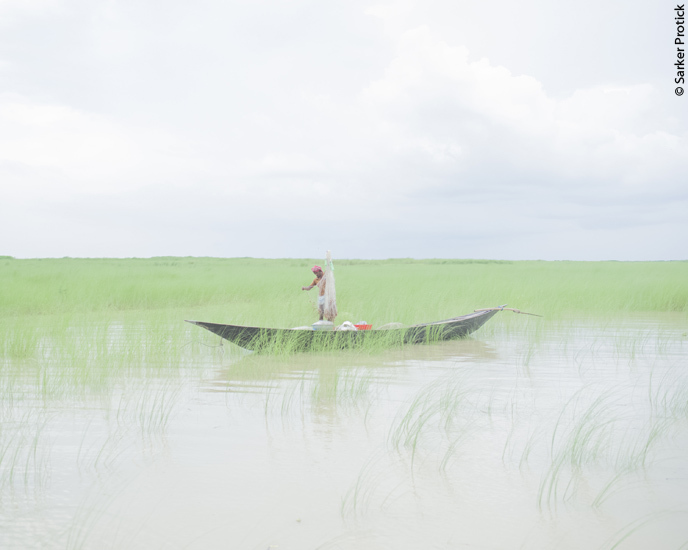 Bangladeshi photographer Protick Sarker was still a high school student in the 2000s when he discovered the novel Padma River Boatman by Manik Bandopadhyaya – a classic of twentieth-century Bengali literature. The very special relationship between people and water – bringing both prosperity and destruction – depicted in the book, is familiar to him. Born in the land of wild rivers, Sarker, like his 162 million fellow citizens, lives to the rhythm of the monsoons – which inundate a third of the country every year, between May and September. These floods have devastating effects, both on the land and the people, as does the river erosion, which causes the loss of between 1,500 hectares and 3,500 hectares of arable land each year*. But it is these same floods that make the fields of the Bengal Delta, which Bangladesh shares with India, so fertile. 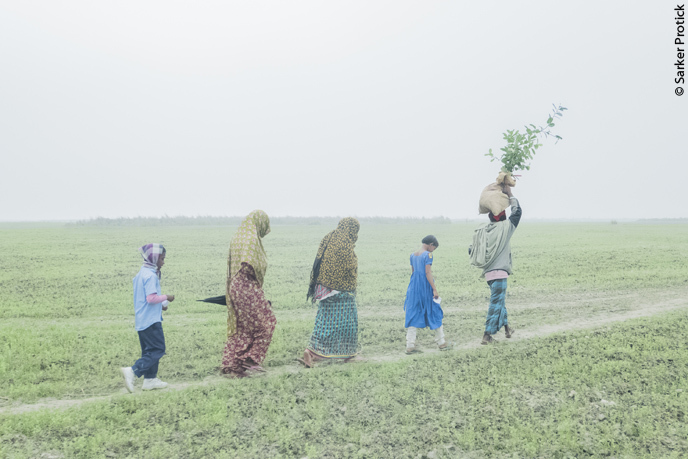 Composed of sediments carried by Bangladesh’s 230 rivers, these well- aerated and irrigated lands attract farmers to settle along the riverbanks in spite of the risk. “The king in the morning becomes a beggar in the evening,” sing the peasants who have lost everything, and yet return to the riverside to rebuild their lives. The incredible ability of his people to live on these lands that are built and destroyed by the floods, had fascinated Sarker as a young student. 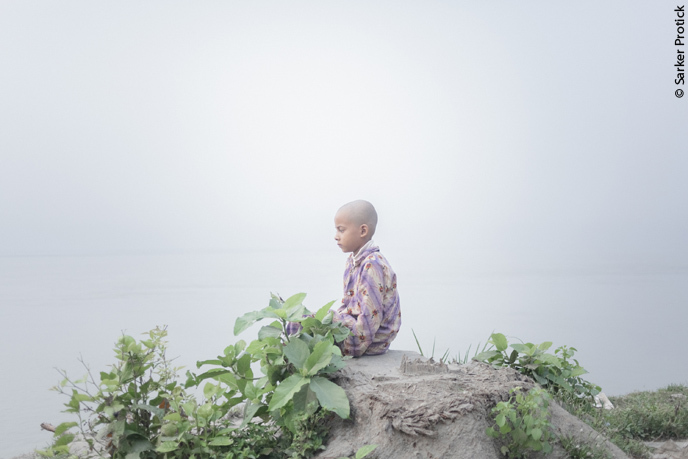 Becoming a professional photographer a few years later, he set out on a journey along the majestic Padma river, starting from the border between Bangladesh and India, where India’s Ganges surges into the Bangladeshi river. And then, as the day of 3 November 2011 was coming to an end, he witnessed the abrupt collapse of a stretch of riverbank, engulfed by the waters. “Suddenly I saw the river erosion which I had read about at school, happening brutally before my very eyes,” said Sarker. The event occurred in the Ishwardi upazila (district subdivision). 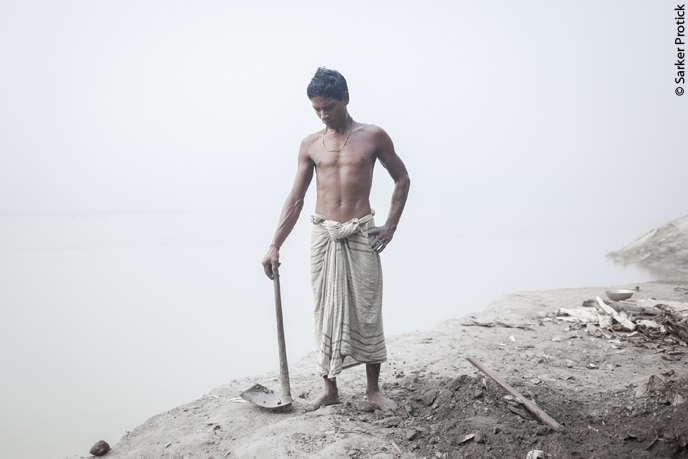 “Seeing these people lose their homes, their land, everything… and at the same time seeing them remain strong and optimistic, and still going on with their lives, touched me deeply.” The man from Dhaka kept returning to the area for seven years to complete his photographic series, Of River and Lost Lands. “It is the story of the places that have disappeared, which have been taken by the river. I wanted the images to convey a certain melancholy, a sense of loss,” says Sarker, who photographed Ishwardi only under foggy monsoon skies. “The series shows how vulnerable we human beings are to nature. But it also shows the cycle of the perpetual renewal of life, which I was keen to explore in my work.” Ephemeral islands, called chars, emerge from the waters after each monsoon and welcome thousands of people left without land**. The adversity of the elements, to which humans seem to have adjusted as best they can, is worsening day by day due to climate change. Bangladesh, which is predominantly flat and low-lying, is particularly exposed to rising sea levels. The multiplication and intensification of extreme weather events and the increasing melting of the Himalayan glaciers, where the rivers of the delta originate, make the nation one of the world’s most vulnerable. The fragile balance that can be observed in Sarker’s photographs is being severely put to the test. With this photo-reportage, the Courier marks World Water Day, celebrated on 22 March. *In 2017, some 950,000 people were displaced due to extreme weather events, according to the Internal Displacement Monitoring Centre (IDMC). **According to the French magazine Hommes & migrations, five million people were living on these ephemeral islands in 2010. 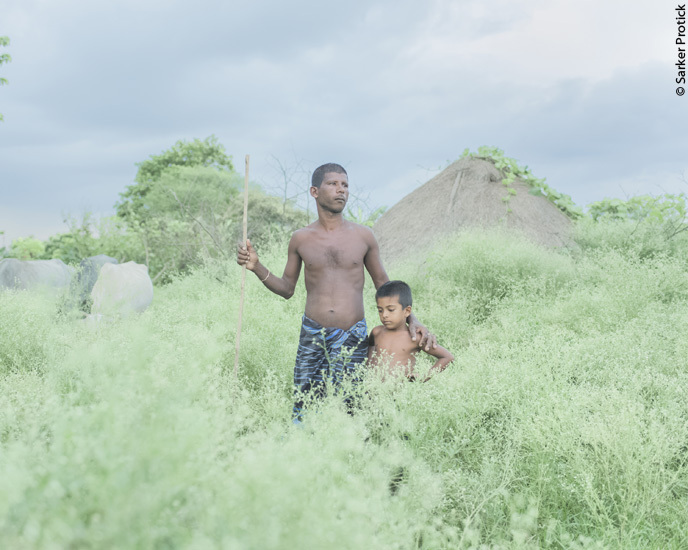 Father and son on one of the ephemeral islands, where the abundance of grass makes it conducive to dairy farming. 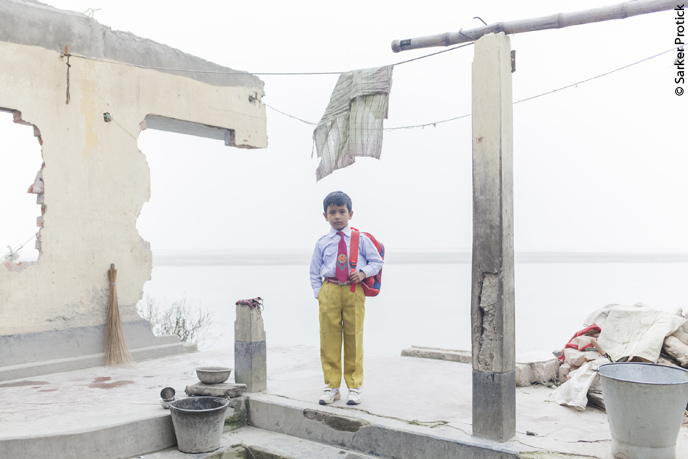 Young Brishty finds herself all alone, after her family was forced to relocate because of river erosion. 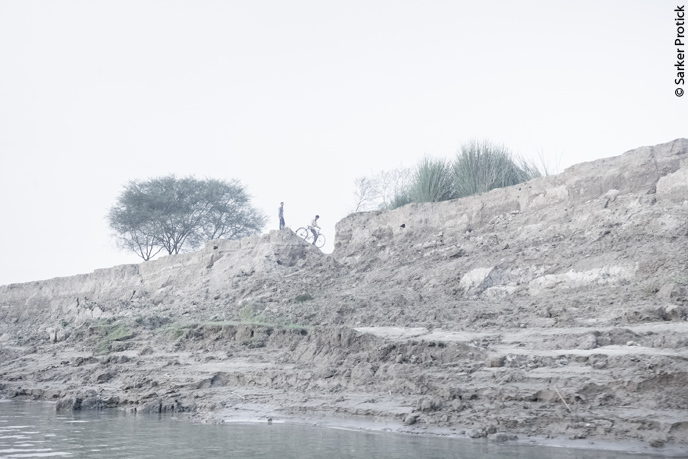 Shom Nath Kumar has permanently left his village after losing everything to the river. Remaining landless, this family arrives from the mainland to settle on a river tank, or island that emerged from the water after the monsoon. Ephemeral islands, or river tanks, attract farmers in spite of their unpredictability. Two men advance cautiously along a river bank that has collapsed.